Ongig first began reporting on top applicant tracking systems in September 2014 and after 30,000 people read one post on it, we decided to update it for 2016. Our goal for this one is that 100,000 of you read it! A list of the top ATS’s being used by companies we know as of March 2016. The names of applicant tracking systems that are growing the highest in market share. A list of the basic categories of applicant tracking systems. A few ATS trends we expect to continue. Some extra links to help you with applicant tracking software solutions. Note on why we do this: Ongig is on a mission to help clients create the best job descriptions in the world and the ATS is what generates the text of most JDs. At the same time, our team interacts with 1,000’s of companies per year and we ask what ATS they use and then compile the data for you. We can’t tell who’s got the best ATS for you but we we hope the data/content below is at least a helpful resource. Note on Criteria: Ongig’s Top Applicant Tracking Systems list is based on 3,302 employers and which ATS we identified they are using. These 3,302 employers are based all around the world, though they are mostly headquartered in the U.S. The complete list of the top 70 applicant tracking systems couldn’t fit in the pie chart above so below is the full list. Check out the The Top Applicant Tracking Systems Annual Report (2017) for many additional pie charts and growth charts! With the benefit of 2 sets of data (2014 versus 2016) we’re now able to share some data on who has grown the fastest in terms of market share. It’s worth noting that a few of these ATS’s (such as Workday, Lever and Greenhouse) were just making their presence know in 2014 and have now become major players. In case you had to squint too much to read the chart above, below is Ongig’s list of the ATS’s we found to be growing the fastest. Note: This is calculated by comparing the change in their marketshare from 2014 to present. If you need to be compliant with the OFCCP, EEOC and other regulatory groups, you will likely be using compliance-oriented ATS’s to allow you to most easily pull the types of reports needed to comply. The top ATS’s for compliance are Taleo (now owned by Oracle), followed by IBM’s Kenexa-Brassring, iCims, ADP and SAP/SuccessFactors. 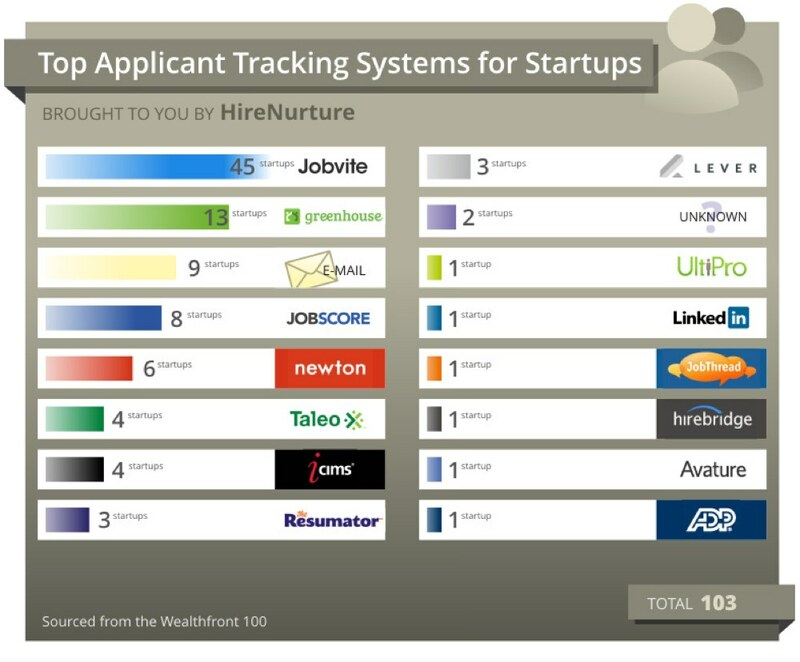 There are a ton of applicant tracking systems for startups. A nice list/infographic of the top ATS’s used by 100 startups comes from HireNurture below. It’s from August 2014 so it’s missing some newer ATS’s such as SmartRecruiters. But it’s stukk the best representation of ATS’s used by startups that we know of. There are applicant tracking systems you can try for free at low volume, such as Jobscore, SmartRecruiters, RecruiterBox and ZOHO Recruit. The free ATS’s typically start charging you once you go beyond a number of jobs or users or after a trial period. Some companies need to use 2 applicant tracking systems. One reason is if they have hourly and salaried employees. Buffalo Wild Wings, for example, uses Ultipro for salaried and SnagaJob for hourly — the salaried workers include Restaraunt Managers (5 at each location) and corporate; while the hourly workers include the restaurant’s full team of hourly folks). Uber is another example: they need to use iCims for their employees while they use a homegrown talent community capture for their drivers (who are contractors). Some companies also inherit a second ATS through a merger or acquisition (Rock-Tenn and Mead West Vaco merged to form Westrock and and each had their own ATS’s (Successfactors and Brassring) which they then had to use in combination. Some employers looking to save money might find that their payroll providers, such as ADP and Paycom, might throw in ATS functionality at discounts to win your business. We saw one company, Wiredrive, using Ziprecruiter (which is more known for job board distribution) as its Applicant Tracking System (indeed, ZipRecruiter mentions itself as an ATS alternative on its site). A number (11%) of companies we’ve talked to use their own homegrown applicant tracking software instead of buying something off the shelf. Employers using homegrown ATS’s include major tech companies such as Apple, Google, Netflix and Facebook. I’ve heard stories about Google’s homegrown ATS — which last I heard is a combination of their homegrown “G-hire” combined with Salesforce.com. One former Apple recruiter tells me Apple’s homegrown applicant tracking system is “weird” in how dead- simple it is. Other companies, including LionsGate and the restaurant Wingstop, still use an email address-based applicant trackng system — we categorize email-based systems as homegrown ATS’s. An email-based application capture is also used by some Fortune 500 companies for smaller geographic regions (sometimes to save money if the ATS charges based on # of regions/languages). Note: If you are interested more in Homegrown ATS’s, check out 5 Huge Employers That Use Homegrown Applicant Tracking Systems. And 9% of the Wealthfront 100 startups (in the infographic above) still use a homegrown, email-based ATS. Taleo — They should continue to be the most commonly used ATS (especially by large businesses), though their market share will decline based on how many other ATS’s are fighting for their business. 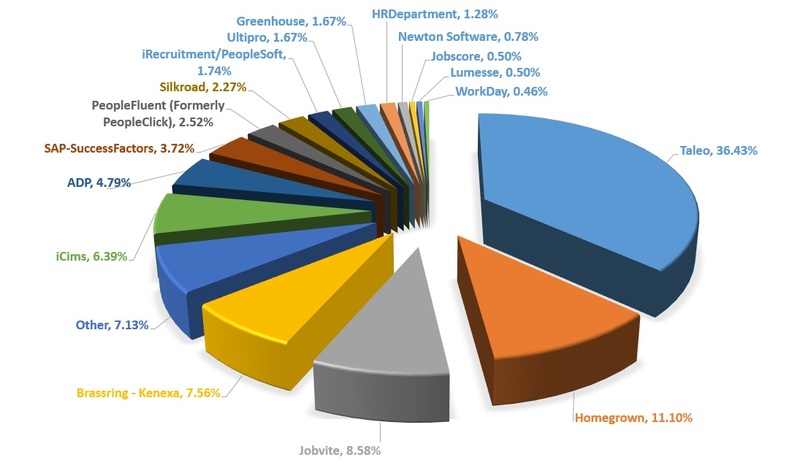 Jobvite — They should continue to be the top ATS market-share-wise in the tech world, though the race is tightening (due mostly to Greenhouse and Lever who are pushing hard to win Jobvite’s current customers). Greenhouse — They will continue to make strides in winning tech clients and will also go “upstream” and make a dent in Fortune 500-type clients. Workday — They will continue to win big clients (Mastercard, Dell, Levi Strauss, etc.) but will also make inroads in the tech/SMB (small & medium-sized) by going “downstream” after smaller employers currently served by ATS’s like Jobvite, Glassdoor and Lever. Workday Recruiting (which includes ATS functionality) is written in the same line of code as Workday HCM (Human Capital Management) so many Workday HCM customers will have the incentive to add the ATS functionality (since it can tightly integrate with compensation, benefits, talent management, etc.). And here’s a great resource on ATS Pricing: Applicant Tracking System Pricing — ATS: How Much do they Cost? Ping us for your opinion on your ATS or any of these trends! We know that Ongig’s list of ATS solutions is missing many great vendors –If you own or use an ATS that is not mentioned above please add a comment below about it and include the uniqueness of it (e.g. what type of customer is it best for, does it serve particular geographies, etc. — and if you can name any clients of yours we can include it in our next top ATS report).